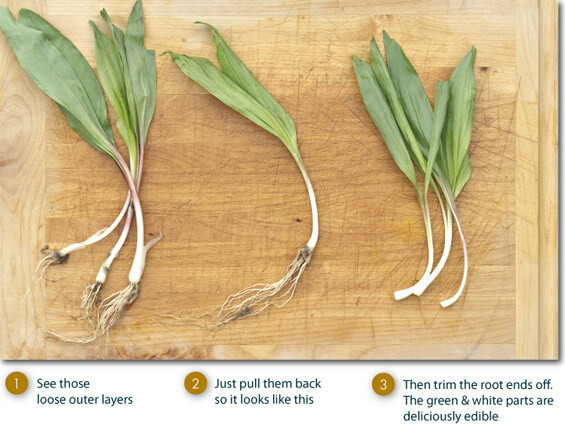 Because wild ramps aren’t a vegetable that many people have encountered before, we thought we’d publish a simple tutorial to getting them ready to eat. 1. Rinse ramps under cool running water. 2. Discard any tough, over-large leaves unless your recipe involves pureeing. (They offer a lot of flavor, but can be difficult to chew). 3. 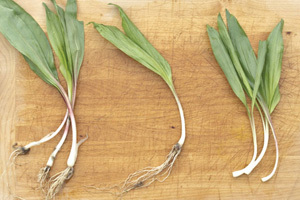 Pull back and peel off any translucent skins (these are similar to the skins you find on scallions or green onions). 4. Trim off the roots. Just fried some minced up in hash brown potatoes and an egg omelet. That sounds super delicious. I want some!